The online retailer made its debut at No. 492 on the Fortune 500 back in 2002, the same year its biggest competitor Walmart first landed in the No. 1 spot. Amazon has since quickly gained on, and nearly caught up with, Walmart. With revenue of $177.87 billion, Amazon placed eighth on this year's list of America's largest companies. That's up four spots from its rank last year as No. 12. 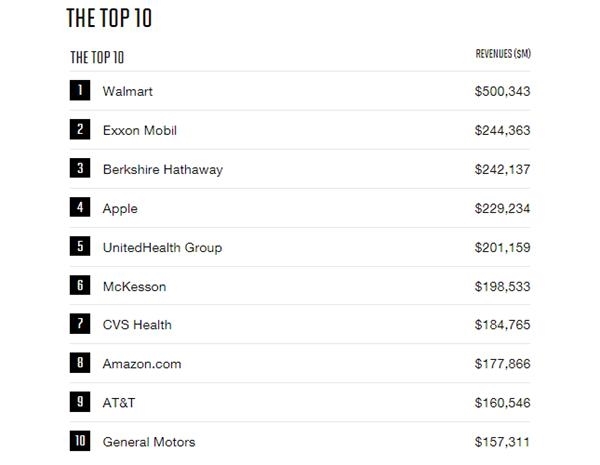 For the first time in history, Amazon has cracked the top 10 of the Fortune 500 list, alongside such behemoths as Apple, Berkshire Hathaway, Exxon Mobil and, of course, Walmart. With revenue of $177.87 billion, Amazon placed eighth on this year's list of America's largest companies. That's up four spots from its rank last year as No. 12. 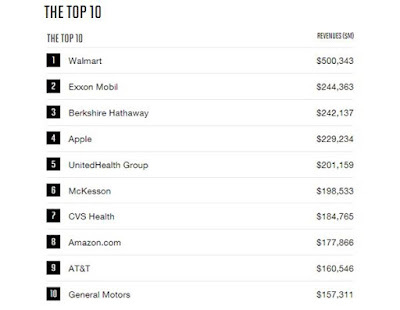 The online retailer bumped Fortune 500 veteran General Motors down to 10th place and Ford Motor out of the top tier altogether. The online retailer made its debut at No. 492 on the Fortune 500 back in 2002, the same year its biggest competitor Walmart first landed in the No. 1 spot. Amazon has since quickly gained on, and nearly caught up with, Walmart. It's been a big year for Amazon CEO Jeff Bezos: He has not only become the richest man in the world, but he has also helped make Amazon the second most valuable company in the world, behind Apple. His success can arguably be traced back to a risk he took when he was 30 years old. Bezos was a straight-A high school student and the class valedictorian, and he got accepted via early admission to Princeton, according to Brad Stone's biography "The Everything Store: Jeff Bezos and the Age of Amazon." He majored in computer science and electrical engineering, and then went on to work various finance and tech jobs after college. It was while serving as a vice president at the hedge fund D. E. Shaw in the 1990s that Bezos came up with the idea to sell books over the Internet. Doing so, though, would mean taking a significant risk and perhaps sacrificing his stable job. "I came across the fact that Web usage was growing at 2,300 percent per year," Bezos said in a 2010 address at his alma mater. "I'd never seen or heard of anything that grew that fast, and the idea of building an online bookstore with millions of titles — something that simply couldn't exist in the physical world — was very exciting to me." At the 2017 Summit LA conference, Bezos recalled that, when he told his boss about his Internet bookstore idea, his boss said, "I think this is a good idea, but I think this would be an even better idea for somebody that didn't already have a good job." That's when Bezos considered what his 80-year-old self would say if he did or didn't seize this opportunity. "In most cases, our biggest regrets turn out to be acts of omission. It's paths not taken and they haunt us. We wonder what would have happened," Bezos said at Summit LA. "I knew that when I'm 80, I would never regret trying this thing that I was super excited about and it failing. If it failed, fine. I would be very proud of the fact when I'm 80 that I tried. I also knew that it would always haunt me if I didn't try." After "a lot of soul-searching," Bezos quit his job to start his dream company in 1994 and the decision paid off: Amazon went public three years later. Today, Amazon is valued at over $767 billion and those who invested in the company early on are reaping the benefits. Even Berkshire Hathaway CEO Warren Buffett regrets not investing in Amazon when he had the chance.